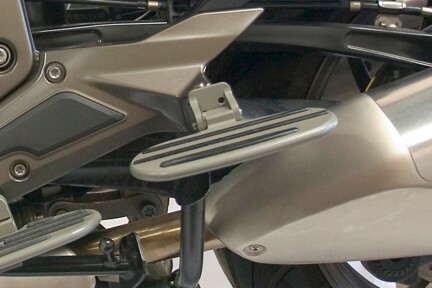 Ilium Works passenger floorboards are floorboards designed specifically for BMW motorcycles K1600GT and K1600GTL. These passenger floorboards relocate your foot position 3/4" lower than stock allowing increased leg room and comfort. These passenger floorboards measure 3-1/4" wide x 7" long, offering increased passenger comfort, support and a variety of foot positions as you ride. The installation of this custom after market BMW motorcycle parts is a simple bolt on procedure. The floorboards are made of 6061 aluminum then powder coated. Screws are stainless steel.